The CreateReportControl method allows you to add new controls to a report. The CreateReport Control method has the following basic syntax. Now, let's modify the prior code to add four fields to the report: CompanyName, ContactName, Title, and Phone. Each field needs a corresponding text box and label. The following modified procedure is one way to accomplish this. 'set the name of the new report strReportName = "Customers"
strSQL = "SELECT * FROM Customers ORDER BY CompanyName"
acPageHeader, , , intPosition) lblLabel.Name = "lblTitle" lblLabel.Caption = "Title"
Set txtTextBox = CreateReportControl(rptCustomers.Name, acTextBox, acDetail, , "Phone", intPosition) txtTextBox.Name = "txtPhone"
In the code example shown again in the following section, notice how a text box and label control are declared and then used to create each of the fields on the report. For example, txtTextBox is assigned to the result of the CreateReportControl method, which specifies the report name, type of control, section to add the control, name of the control, and the position in which to place the control. Various other properties of the text box control are specified, such as the Name and Width properties. The corresponding label control is also created and various settings specified. The same basic steps are then repeated to create each control for the report. Now it's your turn to create a report programmatically. This example creates a report based on a new table that you create and uses a SQL statement as the report's RecordSource property. 1. Create a new database by selecting File C> New C> Blank Database. Specify Ch8CodeExamples for the filename and click the Create button. 2. Add a new tblComplaints table to the database as shown in Figure 8.1. 3. Open the table and add some records, such as those shown in Figure 8.2. 4. Insert a new module into the database. To do so, choose Modules from the Database Window and click the New button. 5. Add the following CreateComplaintsReport procedure to the module. 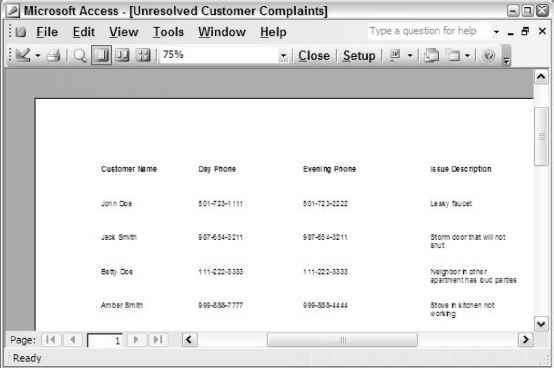 Dim intPosition As Integer 'set the name of the new report strReportName = "Unresolved Customer Complaints"
strSQL = "SELECT * FROM tblComplaints WHERE Resolved=False"
6. Run the procedure from the Immediate Window by typing the procedure name CreateComplaintsReport and pressing Enter. 7. Return to the Database Window and select Reports. The newly created CreateComplaintsReport should appear in the Database Window, as shown in Figure 8.3. 8. Open Unresolved Customer Complaints to preview the report. 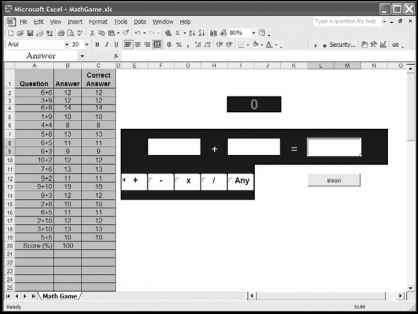 A screen similar to the one shown in Figure 8.4 is displayed. How to generate access report based on textbox? How to access the controls on a report access 2003?